BRUSSELS, BELGIUM, 2015-3-11 — /Travel PR News/ — Brussels Airport welcomed over 1.4 million passengers in February 2015. The airport continues to show steady growth. February was given an extra boost due to the large number of holidaymakers during the midterm break. 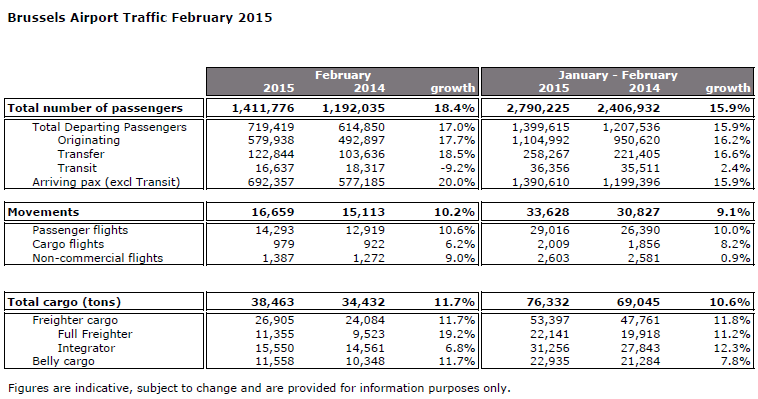 Cargo traffic at Brussels Airport again grew significantly: up 11.7% on February 2014. A notable fact is the very strong growth that was recorded in the full-freighter segment. In February 2015 the number of passengers at Brussels Airport increased to 1,411,776, up 18.4% on February last year. The most significant growth is accounted for by the low-cost airlines, the long-haul flights and Brussels Airlines. Growth is partly explained by the larger number of local passengers departing from Brussels Airport (+17.7%), in particular during the midterm holidays which this year fell in February instead of March as was the case last year. But the number of transfer passengers too grew strongly compared to February 2014 (+18.5%). Cargo traffic at Brussels Airport continues to do very well with a growth of 11.7% on February 2014. A very strong result compared to other European airports where cargo traffic on average decreased by 1.1%. This result is the more remarkable because the Chinese New Year fell in February and that this time of the year traditionally is a quiet period in global cargo transport. Growth was recorded in all cargo segments, with very strong growth in the full-freighter segment (+19.2%) compared to February last year due to the new routes and carriers that started operating from Brussels Airport, including Qatar Cargo and Ethiopian Cargo. They moreover use the most modern cargo aircraft: A330F (Qatar) and B777F (Ethiopian). These aircraft are much quieter than their predecessors. Compared to February last year, the number of movements grew by 10% to 16,659 flights in February 2015. This is a smaller increase than that in passenger numbers of cargo volume. The most significant increase was recorded in the number of passenger flights (+10.6%). The number of cargo flights grew by 6.2% and the number of non-commercial flights by 9.0%. This entry was posted in Airlines, Airports, Business, Flights, Transportation, Travel, Travel Management, Travel Services, Travelers and tagged Brussels Airport, cargo traffic, passengers. Bookmark the permalink.